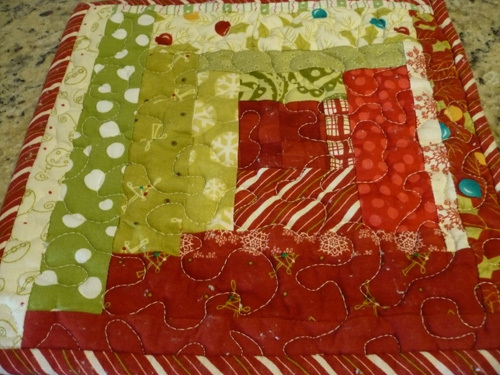 Linda kindly asked me to reveal my Merry & Bright quilt, and since I’m 99.999% positive the recipient of this quilt does not read this website I figured it would be just fine to share it with all of you. 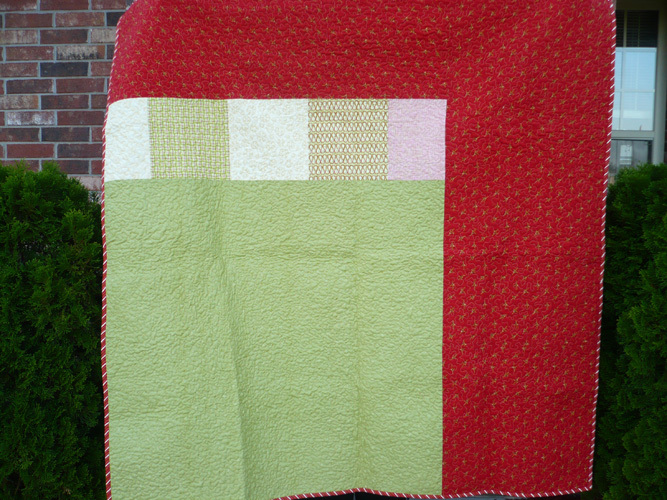 If you remember I started with a layer cake, and because sometimes I think simple is best, I decided to just sew the 10×10 squares together. You really get to appreciate the entire line this way, and I really do love the simple squares. 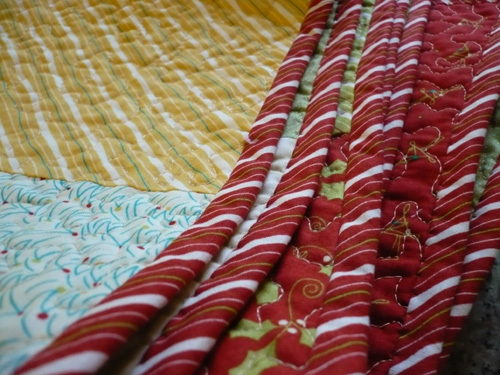 I absolutely love this quilt, and I’m so glad I bought 2 layer cakes, because this way I can make one for us too…but that will have to wait because I have so many projects I want to do! 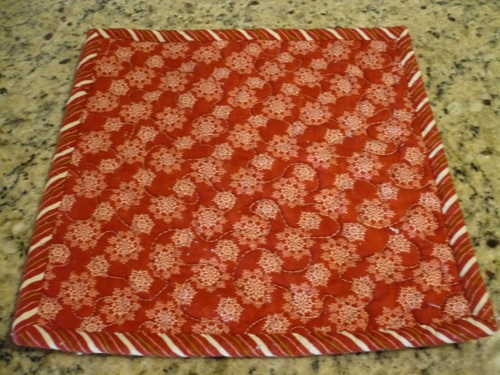 So here is the unwashed and unlabeled “finished project.” It measures as a 57″ square (prewashed). 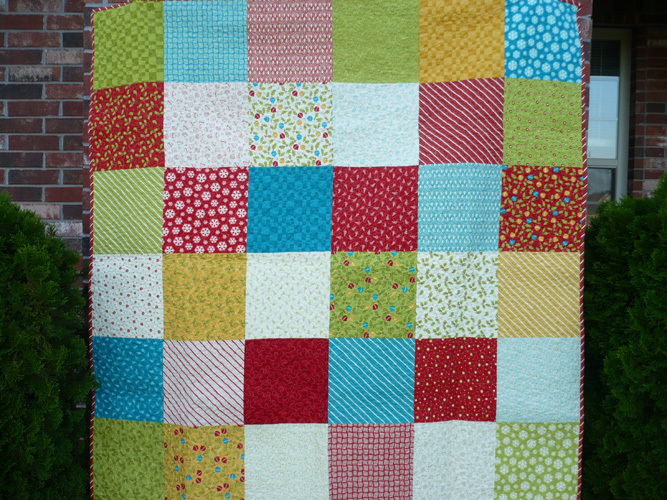 Now that this quilt is done (except for the label) I can move on to other projects. I have more quilt tops completed than I’m willing to admit (there are more than I have listed to the right under quilts in progress…not sure if that’s a or a ), so my goal is to get some of those quilt tops quilted and finished. 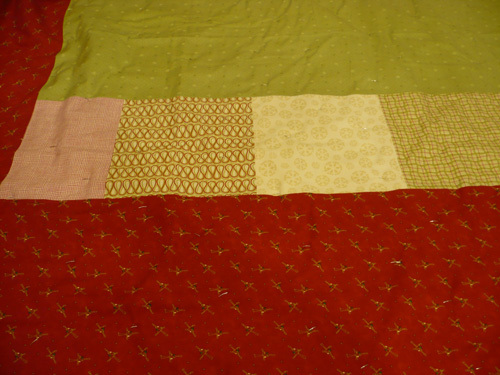 Instead of starting new projects I’m going to finish some of those quilts in progress…that’s the goal anyway. Ethan had his first day of Kindergarten yesterday!!!! Since we have to be out the door 90 minutes earlier than we did for preschool, I’m finding I too need to go to bed earlier. And since most of my quilting happens in the evenings after the kiddos are in bed, my earlier bedtime means less time to quilt. 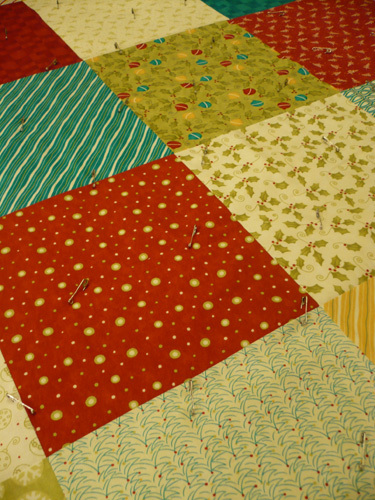 Bummer, but hopefully I’ll adjust and still work in some good quilting. 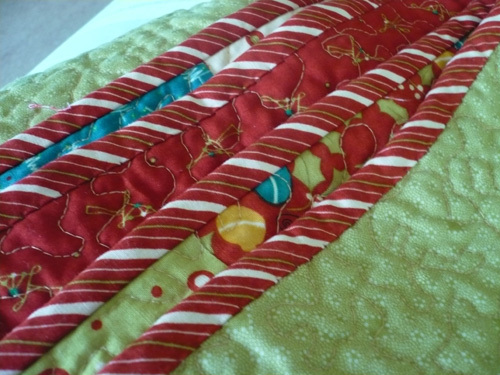 In the meantime I’ve been hand sewing the binding to the back of the Merry & Bright quilt. 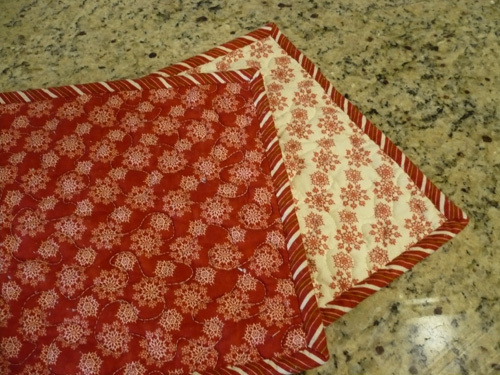 Last night I made the binding for the Merry & Bright quilt. 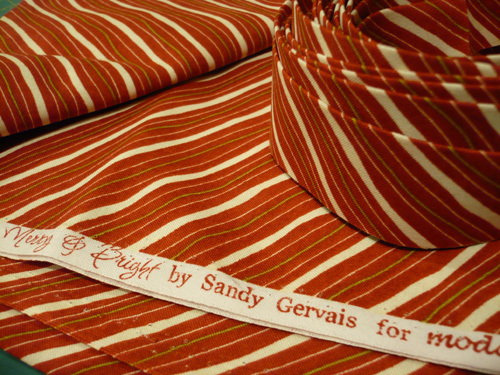 The fabric is from the same line, and I just love the stripes, as they are on the bias, so I get the effect of bias stripes without having to cut on the bias. I don’t mind cutting on the bias, but if I don’t have to all the better! 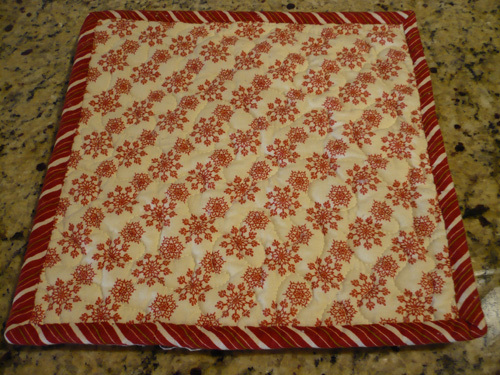 Today I put the walking foot on my machine and sewed the binding to the front of the quilt. 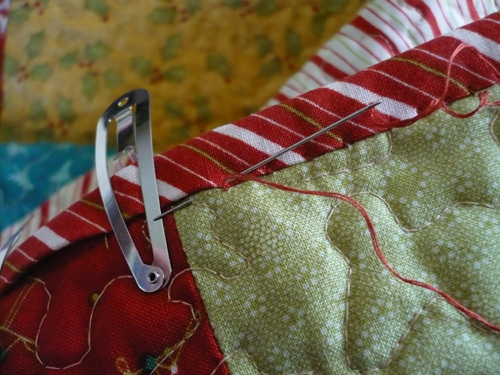 Now on to the time consuming task of hand sewing the binding to the back of the quilt. But I think that will have to be another day, because there is some good tv on tonight (Burn Notice and Royal Pains). 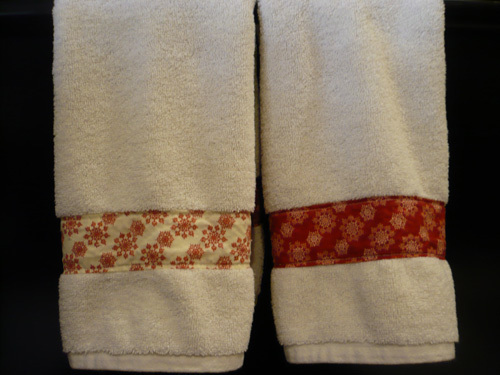 I usually watch tv that doesn’t need my full attention while I sew the binding on…so perhaps tomorrow. 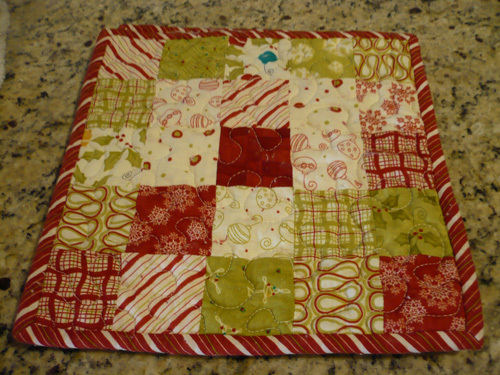 I’ve got my Merry & Bright quilt top and backing sandwiched together and pin basted. I went to my local quilt shop today and got a cool gold toned (but it’s not shiny or anything like that) thread for the quilting. Now I just need to find the time to quilt this baby. 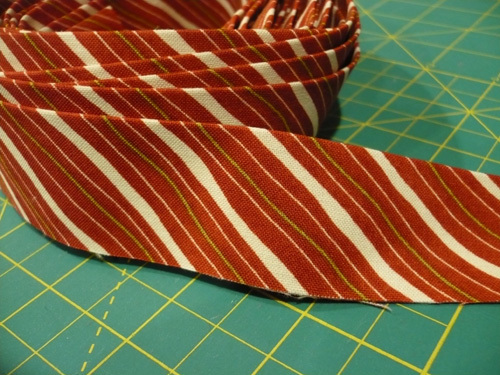 We are back from vacation, and my sewing machine is back from getting a good cleaning and tune up…yay! 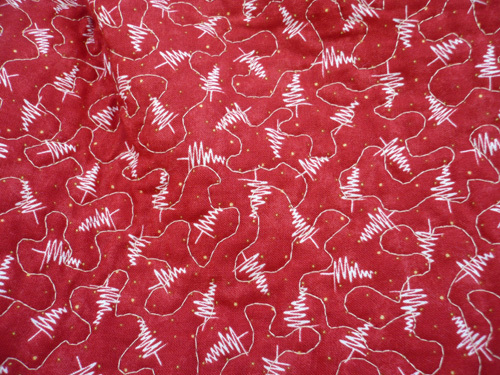 I managed to finish quilting the Ellie Fun quiltop, and now it’s on to the binding. I’ve got the binding sewed on to to the front and now am in the beginning stages of hand sewing the binding to the back of the quilt. 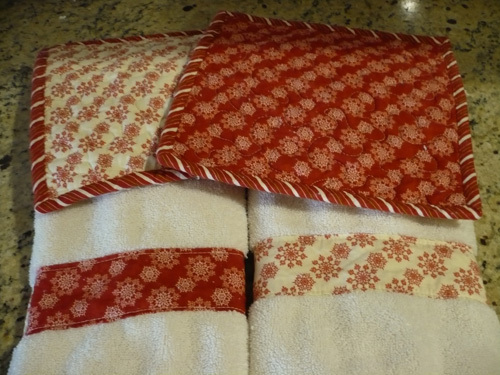 I usually like to finish a project before starting a new one, but I was feeling the need to be creative a few nights ago, so I broke out my Merry & Bright layer cake and got started. I’ve got the quilt top done, and last night I finished piecing the back. 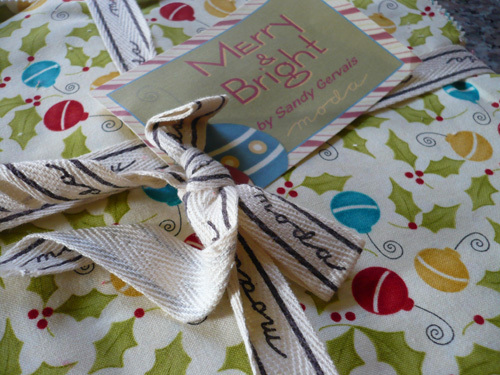 It’s a gift, so you’ll have to wait until December to see the completed project, but I may give some sneak peaks! 😉 I just love this line…so much so that I bought a layer cake for myself to someday turn it into something fabulous, but my quilt will have to wait for another day.